The Fly Nighstand is part of Interni Modern Collection by Rossetto and is a sleek contemporary nighstand. Nighstand features two spacious drawers, transparent plexi-glass legs and a rectangular appearence to perfectly complement the bed. 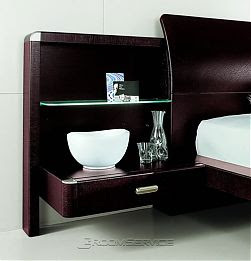 The Fly Nighstand is a perfect complement to the Glamour Leather Platform Bed by Rossetto. Sleek Italian design and attention to details in the Fly Nighstand is sure to impress and add a touch of class to your contemporary decor. Please note that this is an authentic Fly Nighstand by Rossetto imported from Italy. Imported from Italy, the Crono Leather Nightstand is unique in its sophisticated design and contemporary style. The Crono Leather Nightstand exerts opulence and elegance while upholding high quality standards and flawless craftsmanship. The Crono Leather Nightstand is a perfect complement to the Crono Leather Platform Bed. An impressive centerpiece in any modern space, this spectacular modern nightstand inspires tranquility. It speaks of exquisite taste and compliments any modern decor. The Crono Leather Nightstand is made from Solid Italian Wood and features dark chocolate top grain Italian leather with white stitching as well as stainless steel handles. Made in Italy by Rossetto, Diamond Two Drawer Nightstand features an unusual drawer design element with top drawer upholstered in crocodile-print leather and features Strass Swarovski Crystals, while the bottom drawer is finished in high-gloss black lacquer. Fits perfectly with the Diamond Platform Bed and the Diamond Dresser and Mirror, all part of the extraordinary and refined Diamond Collection by Rossetto. Imported from Italy, the Meti Nightstand is unique in its sophisticated design and contemporary style. The Meti Nightstand exerts opulence and elegance while upholding high quality standards and flawless craftsmanship. 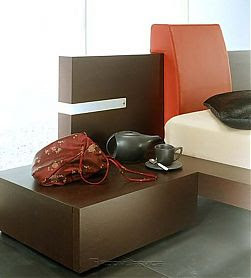 The Meti Nightstand is a perfect complement to the Meti Platform Bed. An impressive centerpiece in any modern space, this spectacular modern nightstand inspires tranquility. It speaks of exquisite taste and compliments any modern decor. The Meti Nightstand is hand made from Solid Italian Wood and features stainless steel accents. The Meti Nightstand features a glass shelf with a built-in light. Imported from Italy, the Enter Nightstand in a Wenge finish is unique in its sophisticated design and contemporary style. The Enter Nightstand exerts opulence and elegance while upholding high quality standards and flawless craftsmanship. The Enter Nightstand is a perfect complement to the Enter Platform Bed. An impressive centerpiece in any modern space, this spectacular modern nightstand inspires tranquility. It speaks of exquisite taste and compliments any modern decor. 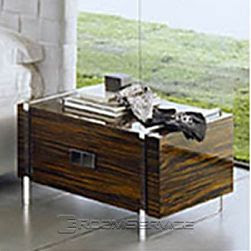 The Enter Nightstand is hand made from Solid Italian Wood and features stainless steel accents. 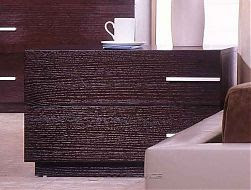 The Star Nightstand by Rossetto features a rich wenge finish and comes in either a right or left drawer front. The Star Nightstand by Rossetto is the ultimate in contemporary furniture. The Star Nightstand comes in a rich wenge finish and comes in either a right or left drawer front. 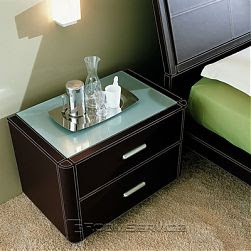 Boxy lines made the nightstand simple in appearance but elegant in design. The drawer handles are brushed metal finish. The nightstands are designed to have drawer pulls on either the left or the right side. Choose a left or right nightstand depending on which side you would like to place the nightstand. Or choose both to have one on each side of your bed. These gorgeous nightstands are designed for a platform style bed and feature 2 drawers for storage. Star Nightstand is a perfect complement to the Pavo Platform Bed. Simple design and attention to details in the Star Nightstand is sure to impress and add a touch of class to your contemporary decor. The Win 1 Drawer Nightstand is part of Modern Interni Collection by Rossetto and is a cutting edge Contemporary Nightstand. The Win One Drawer Nightstand by Rossetto is part of Interni Modern Collection and is a cutting edge contemporary nightstand. Available in wenge and teak finishes, the Win 1 Drawer Nightstand features a clear-cut appearance and is a perfect complement to the Win Bed. This simple yet elegant nightstand sits next to the Win Bed for a perfect integration with the rails of the bed. 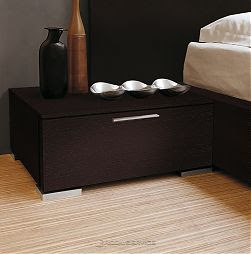 Thanks to the simple contemporary design Win Nightstand will look great with with any wenge or teak platform bed. Simple design and attention to details in the Win Nightstand is sure to impress and add a touch of class to your contemporary decor. Please note that this is an authentic Win Nightstand imported from Italy. Beautiful and simple, the combination table could stand alone or as part of group of tables put together. 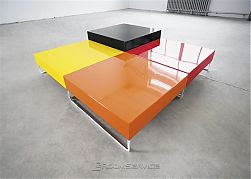 Available in five different colors to match your interior decor, the Cross Contemporary Coffee Table could put the finishing touch to your living room area and add modern style to any furnishings. Designed in Denmark, the Cross Coffee Table/Nightstand comes in two different sizes and three heights to fit into many spaces without overwhelming them. This chic table could also be multifunctional and serve as a nightstand with any bed or futon.